If you love sushi like me, you are probably very critical when it comes to it. Shibuya in Calabasas is known for good quality, high-end sushi. It’s definitely more on the pricey side, but it’s worth it for the quality of fish they have. Shibuya is TINY. If you go for dinner, there will most definitely be a wait because this small place is always crammed to the max. Even during lunchtime all the tables are usually filled. If you go, expect to wait for a table. This little gem is in a small strip mall in Calabasas, so sometimes parking can be tough too, depending on what time of day it is. Shibuya isn’t a fancy restaurant by any means. It’s actually the contrary- it may be a little pricey, but it’s just a hole in the wall with great sushi. THIS IS PRETTY MUCH THE ENTIRE RESTAURANT. TINY & CRAMMED! ~ALBACORE SASHIMI W/ GARLIC PONZU & JALAPENO- SO GOOD. AMAZING QUALITY AND SO FRESH TASTING. IT MELTS IN YOUR MOUTH! LOVE LOVE LOVE. CREAMY ROCK SHRIMP TEMPURA- ALSO ONE OF MY FAVORITES. LOVE THIS DISH. CRISPY, CREAMY & DELICIOUS. I CAN EAT A HUGE BOWL OF THIS LOL. 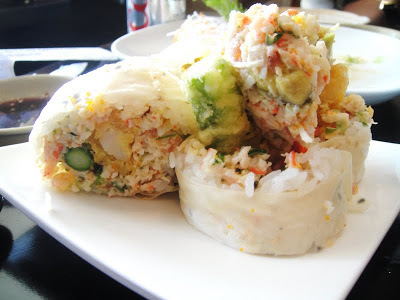 *SHIBUYA HOUSE ROLL- THIS IS SHIBUYA’S SIGNATURE SPECIAL ROLL. MY FAVORITE ROLL ON THE MENU. A MIX OF SPICY TUNA, CRAB MEAT, SHRIMP TEMPURA, ASPARAGUS & AVOCADO. I ORDER W/ SOY PAPER BECAUSE I LIKE IT BETTER THAN SEAWEED. SPICY TUNA ON RICECAKE- I DIE FOR THIS. THIS DISH IS A MUST AT ANY SUSHI PLACE FOR ME. SO YUMMY AT SHIBUYA…THEY GIVE YOU SO MUCH SPICY TUNA ON TOP TOO. If you love good quality sushi, Shibuya is a gem spot in Calabasas. I only ordered a couple things on the menu this time but everything is great there. Let me know what you think!